Today’s post is really more of a confession. I’ll let you in on another secret: I completely failed my reading list from last year. I missed it by a wide margin. I didn’t even read half of the books on my list. I’m not even sure I read a quarter of them. 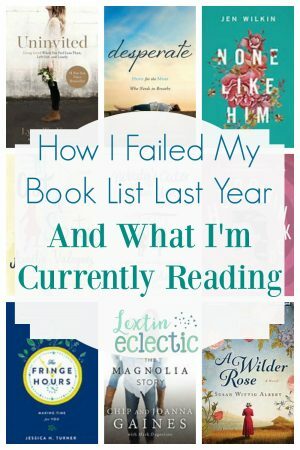 I failed so badly that I refused to make a reading list for this year. I didn’t want to fail yet again! First, I was way too ambitious. My list was so long! I chose books that sounded interesting in January, but by May I was more interested in different topics or authors. I no longer felt inspired to read the books on my list. I had no real goal set other than to finish all the books. I should have chosen to read a set number of books per month to help break my goal into smaller, more doable chunks. One of the books let me down in a big way. A few months into my reading list, I was in the middle of one of the books and it wasn’t quite what I expected. The plot line wasn’t quite as “squeaky clean” as the books I typically choose to read. I felt annoyed and discouraged, but I felt compelled to try to finish everything on my list. Afterward, I felt like I had wasted a lot of time on a book that wasn’t worth reading. Throughout the year friends recommended books to me and I wanted to read them, but I felt obligated to stick to my pre-made list and continue the books I was currently reading. However, I had begun to feel unenthusiastic about my list, wanting instead to read all of the books that I had recently discovered. So I read nothing – not the books on my list nor the wonderful books my friends recommended to me. Crazy, right? This year I’ve changed my reading goal. I’m going to read two books per month and I get to choose them as I go. If I don’t like a book I’ve chosen, I don’t feel like I have to read it simply because it’s on my list. And if I find a new and more interesting book, I can jump right into it next because I have no list. Well, I do have a Pinterest board full of suggestions – but it is not a list. I will tell myself again, It is not a list! I can do whatever I want this year as long as I’m reading SOMETHING. It’s really freeing! So here’s to not making a book list! If you know me well, you’ll know that my slightly OCD and Type A self is really cringing at the thought of doing away with a list. I’m being a little bit spontaneous which almost never happens. But this is proof that even I can change a tiny bit. So maybe you should consider not making a book list for this year. Live outside the list and choose books as you go. You might stumble upon some great reads! If you need some inspiration you can check out what I’ve read recently and what I’m currently reading. Oh this one was good! Has any mom ever felt a bit desperate? I have! The chapters are so honest and real. I could relate to so much of what Sarah Mae wrote. The encouraging words fed my soul! This book listed 10 myths of motherhood and debunked each one. I realized that I had a few wrong perceptions about motherhood. I loved the reminder that everything does not depend upon me. As a mom, I sometimes feel like I play the most important role in my kids’ lives. Nope, God does that. This book was a worthwhile read for those small reminders. Not a book I would choose on my own but I think I got it for cheap or maybe even free for Kindle. It’s a French novel that is mostly about a grumpy older gentleman and a young girl who changes his perspective on life. It was interesting – not riveting or amazing. But it was a fun read that was fairly quick (and I got it cheap, so there’s that). This was one of my more fun/feel good books. I read Sparkly Green Earrings earlier in the year and it was just so funny and real. Therefore, I had to read the Melanie Shankle’s book about marriage. Hilarious! After reading about that antelope in her living room, I decided I needed to read Melanie Shankle’s book about friendship. I may have giggled uncontrollably while reading it and maybe cried a little too. A great light read! I love reading the Little House books to my kids, so I absolutely had to read this book about Laura Ingalls Wilder and her daughter Rose. The historical time period, dialogue, and relationship strugglers were so authentic. I had no idea that Rose played such a large role in publishing the Little House series. This book totally changed my perspective on Laura Ingalls and the Little House books. Time management and making time for yourself? Yes, please! I need this! However, I’m having trouble making time to read this one. Clearly, I need major help! A fun read about the couple behind the Fixer Upper show? Yes! It’s a little bit scary how their personalities remind me so much of my husband and me, except that Chip seems slightly more spontaneous and crazy than my husband – something to be thankful for I guess. This is a deep and rich book that explores the names of God. I’m slowly working through this one and trying to savor all the rich truths in it. I’m reading this along with my Bible study group. The premise is to live loved even when you feel lonely, less than, or left out. I’m just over here feeling very insecure as I try to tackle my insecurity, so I can live loved. Yikes! I need this one and I apparently have a long way to go! Now tell me, do you have a reading list for this year? What’s on it? Maybe I’ll add some of those books to my list – ahem, suggestion board. I love Melanie Dale! So funny! And the writers retreat I was on? Done by Sarah Mae! I need to read Uninvited. Right now I’m reading one of the Mother-Daughter Book club books. And a book in spiritual formation. I’m a little jealous that you got to hang out with Sarah Mae! I really enjoyed her book. So honest and refreshing. I could SO relate!